Astrid is a Nord assassin, the leader of the last remaining Dark Brotherhood Sanctuary in Tamriel, and the wife of former Companion Arnbjorn. She also initiates many of the quests in the Dark Brotherhood questline. 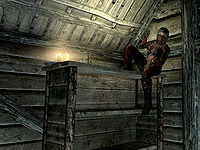 When you first meet her in the Abandoned Shack, Astrid wears the typical Dark Brotherhood garb consisting of Shrouded Armor, Shrouded Gloves, Shrouded Boots, and a Shrouded Cowl. However throughout the rest of the Dark Brotherhood questline, she is seen without her cowl. She also carries around the Blade of Woe. After joining the Brotherhood, if you ask Astrid about herself, she will explain how she joined the Brotherhood: "This Sanctuary has been my entire life since I was a young woman. That's when I first discovered my, shall we call it "aptitude," for elimination. I had an uncle, you see. He made certain... unwanted advances. So I killed him. And liked it. Then I killed again. And liked it even more. And so on. I was recruited by the Dark Brotherhood, and have been here ever since. I met my husband Arnbjorn, rose to leadership. And now here we are." When Cicero and the Night Mother arrive to the Sanctuary, Astrid becomes weary of the Keeper's presence which is seen when you ask her about whether things will change on the matter: "Very little. You have my word on that. The Night Mother represents a chapter in the Dark Brotherhood's history that has long since been closed. Today we live by our own rules. We're the last Sanctuary in all of Tamriel, and only by forgoing the old ways have we survived for so long. My only worry is her "Keeper." I'm not sure what Cicero expects to gain by bringing the Night Mother here, but he'll soon learn this is my Sanctuary." Her growing paranoia of Cicero eventually leads to his attempt to murder her during the quest The Cure for Madness, for openly speaking badly of the Night Mother, to which she openly admits: "If I'm being honest, I haven't exactly been discreet lately in expressing my frustration with this whole situation. Obeying the Night Mother. You being the Listener. It's ridiculous. No offense. Cicero may have overheard me talking to one of the others about the Night Mother. It's possible I was... not entirely respectful." When you awaken from your slumber after receiving a mysterious note, you will be introduced to Astrid, a member of the Dark Brotherhood. She will begin to initiate the conversation: "Sleep well?" Questioning her, she will respond: "Does it matter? You're warm, dry... and still very much alive. That's more than can be said for old Grelod. Hmm?" Once you realize that she knows about the murder, she will elaborate: "Half of Skyrim knows. Old hag gets butchered in her own orphanage? Things like that tend to get around. Oh, but don't misunderstand. I'm not criticizing. It was a good kill. Old crone had it coming. And you saved a group of urchins, to boot. Ah, but there is a slight... problem. You see, that little Aretino boy was looking for the Dark Brotherhood. For me, and my associates. 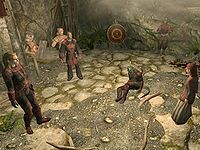 Grelod the Kind was, by all rights, a Dark Brotherhood contract. A kill... that you stole. A kill you must repay." If you choose to hear her out, she will tell you: "Well now. Funny you should ask. If you turn around, you'll notice my guests. I've "collected" them from... well, that's not really important. The here and now. That's what matters. You see, there's a contract out on one of them, and that person can't leave this room alive. But... which one? Go on, see if you can figure it out. Make your choice. Make your kill. I just want to observe... and admire." Alternatively, if you choose to walk away from her, she will continue: "I'll cut right to it. You murdered the old woman in the orphanage. You owe the Dark Brotherhood a kill. I've come to collect. One of these poor sods has a contract out on their life. Which one is it? Any idea? Make your choice. Make your kill. And you get to walk away." At this point, you can decide whether to kill one of the three hostages or kill Astrid and initiate the quest, Destroy the Dark Brotherhood! If you chose not to kill Astrid, she will now tell you: "I would like to officially extend to you an invitation to join my Family. The Dark Brotherhood. In the southwest reaches of Skyrim, in the Pine Forest, you'll find the entrance to our Sanctuary. It's just beneath the road, hidden from view. When questioned by the Black Door, answer with the correct passphrase: "Silence, my brother." Then you're in. And your new life begins. I'll see you at home." Once you locate and enter the Sanctuary, Astrid will greet you: "Ah, at last! I hope you found the place all right." Asking about what happens now, she will go on to explain: "Well, what happens now is you start your new life in the Dark Brotherhood. You're part of the Family, after all. This, as you can see, is our Sanctuary. You won't find a safer place in all of Skyrim. So get comfortable." She will also be planning a contract for you to fulfill, but will direct you to see Nazir in the meantime. However, before you go and speak to Nazir, she will present you with the Dark Brotherhood armor and tell you: "Soon, the Night Mother will arrive. And things around here are sure to get even more interesting." "My word is law. Are we clear on that point?" After everyone has finished talking, you may approach Astrid, who will now have a contract for you. She will initiate the conversation by saying: "Ah, there you are. Good, I was done speaking with that muttering fool anyway. We've got some business to discuss." Asking if she has a contract, she will go on: "I do indeed. You must go to the city of Markarth, and speak with the apothecary's assistant. You'll probably find her in the shop, The Hag's Cure. The girl's been running her mouth, wants an ex-lover killed. She's apparently performed the Black Sacrament. Her name is Muiri. I need you to talk to her, set up the contract, and carry it out." If you ask her if there's anything else needed to be done, she will just tell you: "Just do whatever the contact wishes. Be professional, represent us well, and get the job done. Since it's your first contract, I'll let you keep whatever Muiri pays. She'll be generous, I'm sure. They always are." After you have completed the quest Mourning Never Comes, and you return to the Sanctuary, Astrid will greet you: "Ah, you're back. So, how went your first real contract? A bit more exciting than what Nazir's been offering, I'd wager." and begin to express concern about Cicero's behavior within the Sanctuary: "It's Cicero. Ever since he arrived, his behavior's been... Well, erratic would be an understatement. I do believe he is truly mad. But it's worse than that. He's taken to locking himself in the Night Mother's chamber, and talking. To someone. In hushed, but frantic tones. Who is he speaking with? What are they planning? I fear treachery." Astrid will continue to go on: "As the Night Mother's Keeper, he believes he's entitled to the rule of this Sanctuary. Cicero will cite our independence as the need to revert to the Old Ways. He'll claim we're undisciplined, unruly. Heretical, even. Ironically, the Night Mother could prove to be just as much a victim. The queen in a fool's twisted game of chess." She will then ask you to spy on Cicero: "Dear brother/sister, I need you to steal into that chamber, and eavesdrop on their meeting. It'll be no use clinging to the shadows. They'll see you for sure. No, you need a hiding place. Somewhere they'd never think to look. Like inside the Night Mother's coffin." Astrid will then dismiss you with haste, telling you to report back to her with whatever you find out. If you also ask her if she has any idea on who would conspire with Cicero, she will reply: "That's the real question, isn't it? The jester enters, seals the door, and the conversation begins. So someone must be waiting for him inside. Any one of us could enter that chamber silently. Unnoticed. But who amongst us would dare conspire against the Sanctuary? The very thought breaks my heart." "By Sithis, this ends now!" She will now approach you, asking: "Then what in Sithis' name is going on? Cicero spoke to the Night Mother, but she spoke to you? Is this just more of the fool's rambling?" Confirming what Cicero said, she will respond: "What? So Cicero wasn't talking to anyone else. Just... the Night Mother's body? And the Night Mother, who, according to everything we know, will only speak to the person chosen as Listener... just spoke. Right now...to you?" Once you tell her that the Night Mother said for you to speak with Amaund Motierre in Volunruud, she will say: "Amaund Motierre? I have no idea who that is. But Volunruud... that I have heard of. And I know where it is." Asking whether you should go or not, Astrid will dismiss the idea by saying: "Hmm? No. No! Listen, I don't know what's going on here, but you take your orders from me. Are we clear on that? The Night Mother may have spoken to you, but I am still the leader of this Family. I will not have my authority so easily dismissed. I... I need time to think about all this. Go see Nazir - do some work for him. I'll find you when I'm ready to discuss the matter further." Once you have completed the contracts issued by Nazir and have returned to the Sanctuary, you will be interrupted by Astrid who says: "We need to talk. Look. Something is happening here. I'm not sure entirely what that something is, but... Well, we need to find out. If the Night Mother really did give you an order to talk to a contact, we'd be mad to ignore it. And I think we'd both agree, Cicero's brought quite enough madness to this Sanctuary. So go. Go to Volunruud. It's a crypt, pretty far to the northeast. Talk to this Amaund Motierre. And let's see where all this leads. Hmm?" You are now directed to go to Volunruud and speak to Amaund Motierre. Once you've spoken to Amaund and he has given you his sealed letter along with a jeweled amulet, you are to return to the Sanctuary and report back to Astrid. Upon your arrival back, Astrid will begin to question you: "You're back. Good. All right, so? Did you meet this Motierre? What did he want?" When you tell her that he wants the Emperor dead, she will remark: "You're joking." 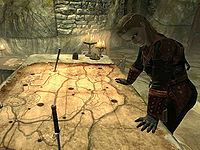 When you show her the sealed letter along with the amulet, she will continue to say: "By Sithis, you're not joking. To kill the Emperor of Tamriel... The Dark Brotherhood hasn't done such a thing since the assassination of Pelagius. 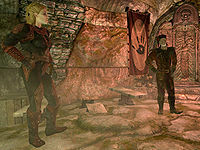 As a matter of fact, no one has dared assassinate an Emperor of Tamriel since the murder of Uriel Septim, and that was two hundred years ago..."
At this point, asking her if the Brotherhood will accept the contract or not, she will laugh at your remark: "You're damn right we'll accept it. If we pull this off, the Dark Brotherhood will know a fear and respect we haven't seen in centuries. You think I'd abandon an opportunity to lead my Family to glory? But this is all so much to take in. I need time to read the letter, and figure out where we go from here. And this amulet. Hmmm..." Asking her what her thoughts are, Astrid will tell you: "I'm thinking we need that amulet appraised. I want to know where it came from, how much it's worth, and if we can actually get away with selling it. And, there's only one man who can give us what we need - Delvin Mallory. He's a fence, a private operator. Works out of the Ratway, in Riften. Give me the letter. Bring Mallory the amulet. Find out everything you can, and sell it if he's willing. He'll offer a letter of credit - that's fine. Delvin Mallory and the Dark Brotherhood have... history. He can be trusted." When you return with the letter of credit from Delvin, Astrid will aprroach you: "Good, you're back. Well, what did Mallory have to say? Is the amulet authentic?" Once you tell her that the amulet is made specifically for members of the Elder Council, she will remark: "The Elder Council... Oh, now that explains quite a bit. Motierre, you naughty, naughty boy. Hiring the Dark Brotherhood to help you rise beyond your station. Delicious." She will also ask if Delvin was willing to buy the amulet, in which you hand over the letter to Astrid. She will now reply with: "Splendid. Then we're ready to begin. Or, more specifically, you're ready to begin. After all, you're the one the Night Mother spoke to. Now then. I hope you have something nice to wear. Because you're going to a wedding." Questioning Astrid about the wedding, she will reveal: "Well, more like the public reception. It should be a lovely affair. You'll mingle with the guests, eat some cake... stab the bride. Oh yes. You've got to kill the bride. At her wedding. And they say romance is dead." Also asking who the target is, she will go on: "Her name is Vittoria Vici. She oversees the East Empire Company's business holdings in Solitude. The wedding is being held in that city, at the Temple of the Divines. Her death will cause an uproar, which is exactly what we want." She will also state that if you manage to kill the bride while she addresses her guests, you will receive a bonus. Upon your arrival back to the Sanctuary, Astrid will rejoice in the deed: "Haha! The news is everywhere! Vittoria Vici, the Emperor's cousin, butchered at her own wedding! Let's see his eminence try to ignore this." When spoken to again, she will then congratulate you on your success: "With Vici's murder, you've started us down a path the Dark Brotherhood hasn't traveled in centuries. The assassination of an Emperor. And now, your reward. A unique spell to summon a legend of the Dark Brotherhood. His soul serves us now in death, as his body once did in life". This spell will allow you to summon the spectral assassin, a powerful spirit to fight by your side. Depending on whether you fulfilled the bonus requirements, she will also give you a leveled amount of gold. Astrid will then carry on: "Now then. Time to proceed to the next stage of the plan. Go and speak with Gabriella. She's been helping me arrange your next contract." Approaching her again, she will tell you: "As I said, go speak with Gabriella. She's been assisting me with your next contract. This Emperor business, well... it does involve everyone." "We've got bigger problems right now!" When you have completed Breaching Security, Gabriella will inform you upon your arrival that an incident occurred involving Cicero and directs you to speak to Astrid. Astrid will begin to speak to you as you enter the main chamber: "Maro is dead, I know. But we've got bigger problems right now!" Asking her what happened, she will continue: "The fool went absolutely berserk! He wounded Veezara, tried to kill me, and then he fled. I knew that lunatic couldn't be trusted." At this point, if you offer your help she will tell you: "I want you to find that miserable little fool and end his life! But first... find my husband. Make sure he's all right. After the attack, Arnbjorn flew into a rage. When Cicero left... Arnbjorn went after him. They disappeared into the wild. Search Cicero's room. Maybe there's something in there that sheds some light on where he might have gone. Let me know the minute you find something. I've got to see to Veezara, and calm everyone down." If you ask her if something set Cicero off, Astrid will explain:"No, nothing. At least nothing I'm aware of. Well... If I'm being honest, I haven't exactly been discreet lately in expressing my frustration with this whole situation. Obeying the Night Mother. You being the Listener. It's ridiculous. No offense. Cicero may have overheard me talking to one of the others about the Night Mother. It's possible I was... not entirely respectful. But to go this far. To attempt to murder the leader of a Sanctuary. Cicero must pay with his life. There is no other option." Also asking if there's any way to work things out, Astrid will continue to say: "Look, the Dark Brotherhood is a family. This Sanctuary is a family. And, we've always welcomed those... shunned by society. Werewolves, wizards, eternal ten year-old vampires... what does it matter? In truth, I've rarely met a lunatic I haven't liked. Cicero's problem isn't his madness. It's an adherence to an ancient, outmoded way of life. The Night Mother's ways... simply are not our ways. He just couldn't accept that. And now he'll have to pay the price." 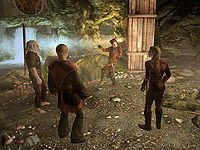 Once you have found Cicero's journal and have reported back to Astrid on his whereabouts, she will remark: "The Dawnstar Sanctuary? Whatever for? Never mind, it doesn't matter. You need to leave. Now. Every moment counts, so I want you to take my horse. His name is Shadowmere. You'll find him outside, by the pool. Let's just say he's... one of us. Take my horse, Shadowmere. You'll find him outside, by the pool. He'll speed your passage to Dawnstar. Find Arnbjorn. Make sure my husband's all right. And then, send that jester's twisted little soul to the Void, in as many pieces as possible." She now dismisses you to go and find Arnbjorn and Cicero at the Dawnstar Sanctuary. If you approach her anytime afterwards, she will only say: "What are you waiting for? My husband is out there somewhere with that lunatic. Find them! Do what you've been tasked to do!" 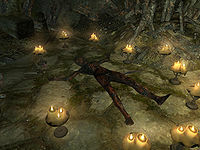 Whether you chose to let Cicero live or not during the quest The Cure for Madness, you are to return to the Sanctuary. Astrid will begin speaking to you upon your return: "Arnbjorn is safe, and for that you have my thanks. But what of the fool? Is Cicero dead?" Depending on whether you killed him or lied to her, she will respond with: "Excellent. Once again, you've proven yourself a born assassin. Tell you what. Why don't you hold onto Shadowmere a while longer? He's a fine steed, and hasn't been ridden nearly as much as he should lately. And now that this Cicero mess has been mopped up, we can get back to the matter at hand, hmm?" She will now direct you onto the next task at hand: "There's just one more target before we strike out at the Emperor. Have you by chance heard of the "Gourmet"? Read his cookbook? It's become quite a phenomenon. The Gourmet is scheduled to cook for the Emperor at a special dinner. You'll kill him, steal his Writ of Passage, and assume the roll [sic] of master chef. Festus has been spearheading this part of the assassination plan. He's close to uncovering the identity of the Gourmet. You should report to him." Once you've completed the quest Recipe for Disaster, Astrid will commend you on your success: "So it's done. You've killed the Gourmet. And now Titus Mede II is as good as dead." Asking if the Brotherhood is ready to assassinate the Emperor, she will say: "Oh yes. And I've decided you will have the honor." When you accept her offer, she will direct you to your next task: "Go now to Castle Dour in Solitude. Present the Gourmet's Writ of Passage to the officer in charge, Commander Maro. I'm sure you remember him. You'll gain unrestricted access to the kitchens, and then the Emperor. You're posing as a chef, so you'll be able to poison his meal rather easily." She will also give you a special poison: "Here, take this - it's called jarrin root. All it takes is one taste, and the effects are quite immediate. The Emperor will be serving Sithis before he even knows he's dead. Once Mede has been killed, escape through the upper door, and across the bridge. I've "arranged" for it to be unguarded once the alarm is sounded. Now go, my friend. Go, and fulfill your destiny as Listener." Upon your arrival back to the Sanctuary after To Kill an Empire, you will find several Penitus Oculatus agents attacking the Sanctuary and the remaining members of the Brotherhood. Once you've cleared out the Sanctuary and emerge from the Night Mother's coffin, the Night Mother will tell you that you must speak to Astrid within the Sanctuary. Once you find Astrid, burnt and immobilized on the floor, she will remark: "Alive.... You're alive... Thank Sithis..." She will then continue: "Ssshhh.... Please. There is much... I have to say. And... not much time... I'm sorry. So very sorry. The Penitus Oculatus... Maro... He said that by giving you to them, he would leave the Dark Brotherhood alone. Forever. By Sithis, I was such a fool. All of this... it's all my fault. You are the best of us, and I nearly killed you... as I've killed everyone else..."
She will then admit her betrayal as she explains why she did so: "I just wanted things... to stay the way they were. Before Cicero, before the Night Mother. Before... you. I thought I could save us. I was wrong. But you're alive! So there's still a chance. A chance to start over, rebuild. That's why I did... this. Don't you see? I prayed to the Night Mother! I am the Black Sacrament." When you ask her what she means, she will go on: "I'm saying you were right. The Night Mother was right. The old ways... they guided the Dark Brotherhood for centuries. I was a fool to oppose them, And to prove my... sincerity, I have prayed for a contract. You lead this Family now. I give you the Blade of Woe, so that you can see it through." Her final wish is: "You must kill... me." After you kill Astrid, her last words are "Uhh.. thank you..."
Astrid is voiced by Cindy Robinson. When an assassin comes after you, they will have a note signed by her. She is a good friend of Delvin Mallory of the Thieves Guild. Astrid as seen throughout the Dark Brotherhood questline: base ID: 0001BDB4, ref ID: 0001BDE8. This Astrid belongs to the DarkBrotherhoodFaction. Astrid as seen at the end of Death Incarnate: base ID: 0004D6D0, ref ID: 0004D6D1. Astrid is immune to all forms of paralysis. 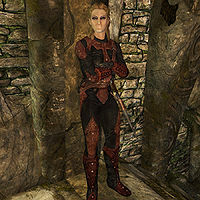 Astrid also appears in Legends, as a character in The Fall of the Dark Brotherhood story expansion. She also appears as a card in the Dark Brotherhood card set. This page was last modified on 11 March 2019, at 22:19.